One of the mainstream capabilities all management software needs to possess is the ability to send a single command or a series of commands to devices instructing them to perform certain tasks - be they simple or complex in nature. Xcalibur W is fully equipped to issue these commands and to track their status. The functions, commands and command queues that can be constructed within Xcalibur W can be saved as tasks that can be used in isolation or as recurring tasks intended to deliver actions on a repetitive basis. Tasks can be simple affairs, such as asking a series of devices to change their display wallpaper, or they can be slightly more involved, such as joining a domain. Tasks can also be highly detailed, such as running scripts to install applications. 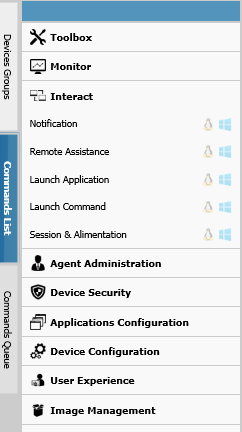 The administrator chooses commands from the Available Commands tab, located on the left of the main Device Listing display. The Available Commands tab is activated when the mouse is hovered over the tab area and consists of a number of top-level functional areas, each with several commands. To build a new Command Queue and convert it into a task or recurring task, access the available commands on the Available Commands tab. The commands available on the Available Commands tab are described in further detail in the Glossary of Functions and Commands. As commands are configured on the Available Commands tab, they are added sequentially to the Command Queue. After building the Command Queue, command order can be changed by drag-and-drop. Delete commands by clicking the symbol. By default, all commands will be run concurrently when sent to the device. However, there are circumstances in which commands should run sequentially - one command finishes before the next one starts. This can be done using the Link capability within Xcalibur W’s Command Queue. Notice the Link icon in the image at left. 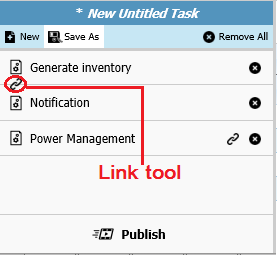 The Notification command will not run until the Generate inventory command has completed. The Command Queue can be saved as a Task Template by clicking the Save icon, located on the top blue bar ( ). Name the Task Template, and then click Save Template. The Command Queue will be saved in the Library’s Tasks section. To publish the Command Queue as a task to devices, click Publish, and then choose to make it an immediate task or a repetitive task.